Timing is everything. 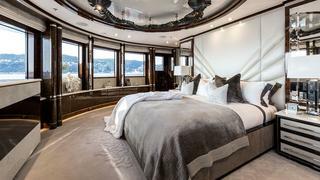 When the original owner of Benetti hull FB265 walked away from the project 10 months before delivery, an opportunity was presented, of the kind the boat’s new owner has made a living out of exploiting. “Let’s just say there was a clear opportunity for a mutually beneficial deal to be done,” he says when we meet on board 11.11. 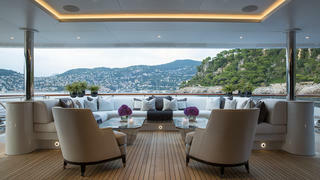 The British businessman had been in talks with Benetti throughout the summer of 2014 about a new project, and when FB265 was left ownerless two-thirds of the way through construction, he made a list. Cons: layout was largely fixed and engineering installed to a different owner’s specification. Pros: he’d get a brand new boat in less than a third of the time it takes to design, commission and build a new one. He spent the rest of that summer weighing it up. 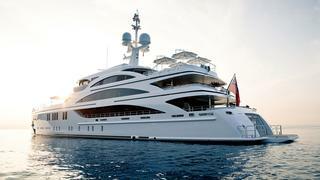 “11.11 is only the second bluff-bowed boat Benetti has ever built, after 65 metre Nataly,” the owner says. 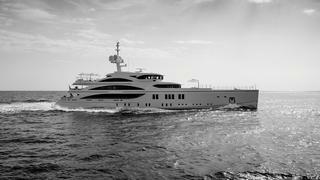 “I was on a boat in Porto Cervo in 2014 and Nataly was there. I just kept looking at her and asked for the tender to take me around the boat. I grew to love the shape more and more. It was exactly what I wanted, so I was sold on the exterior design of FB265. The question was whether we could turn her interior into something which would suit our family, from a design, style and functionality point of view.” The fit-out was about 40 per cent complete when the commissioning owner walked away and some of his choices were a little eccentric. The deal was eventually signed in October 2014, spurred on by news that one or two other buyers were circling, and a delivery target was set for 11.11: July 2015, giving the Livorno shipyard just 10 months to turn a palace into a home. “I had to make a quick decision – go for it or pull out. I was actually in Hong Kong airport on my way home from a business trip and I said ‘let’s do it’. The deal was closed at the airport,” the owner recalls. 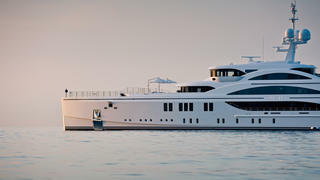 Delivery was nudged back throughout the transformation and FB265 emerged from the yard just weeks before the 2015 Monaco Yacht Show, where the yacht was introduced to the world as 11.11. “If you compare the finished boat with the initial renderings we did for the first client, you would not say they were the same boat,” De Cosmo says. It’s hard to imagine she was ever anything but the monochrome masterpiece she became. Where it was impossible to change styling left over from the first owner, such as the dark, patinated wall panelling throughout, it was made to look deliberate: the dark wood was offset with lighter colours to create a sort of deco-lite interior, for instance. 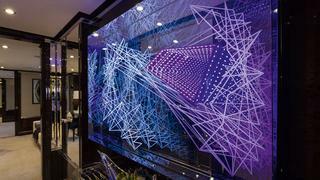 “We wanted that kind of look anyway,” the owner, whose company also designed the interior, says. “Our home in Los Angeles is art deco, too.” Splashed throughout is artwork from the owner’s collection, including, much to his daughter’s delight, interactive butterfly displays by Dominic Harris in the main saloon that flutter at your touch. 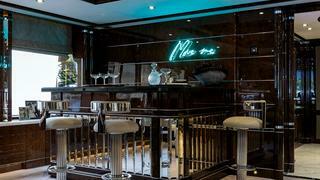 The art animates spaces on board _11.11 _that could otherwise get a bit two-tone and one piece stands out above all: a Tracey Emin neon perfectly located behind the bar in the upper saloon that says: “Move me”. A very close second, however, are works from Hans Kotter, Helmut Newton and photographer David Yarrow. 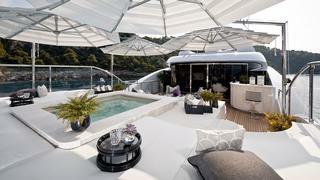 Defying the modern trend for hard, minimalist edges, the main living spaces of 11.11 offer softness and comfort. Part of this comes through the owner’s desire to create a home on the water, but also because it was built into the contract that the boat had to be child-proof: curves are preferred to edges at toddler height and the two main seating areas in the lower and upper saloons cluster around coffee tables you can bounce off, or fall asleep against “while watching Peppa Pig”, the owner smiles. 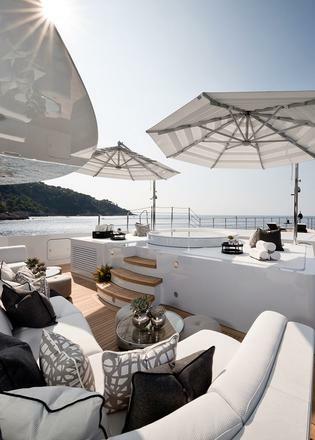 The owner’s wife was heavily involved in the design of _11.11 _throughout and it was a collaborative decision to take the major step of restructuring the sundeck, the biggest job on Benetti’s to-do list once terms were signed. 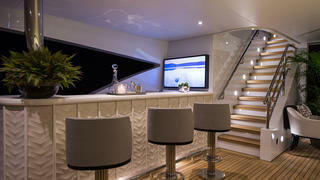 The sun deck was totally redesigned and the owners like to end their days on board in the cosy lounge. 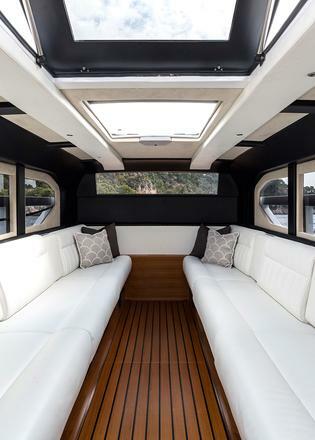 With the transom garage housing a custom Benetti limo tender (the first one it’s ever built) and RIB instead of a beach club, 11.11’s top deck is the pre-eminent leisure area. 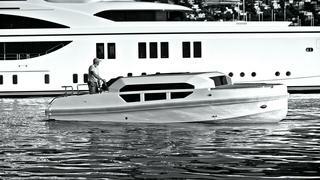 “It was our first project when he bought the boat,” De Cosmo explains. The pool was initially placed where the seating is currently but the new owner wanted it all the way aft, surrounded by sunpads. 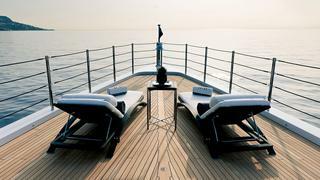 “The deck was completely redesigned, destroyed and rebuilt,” the project manager adds. To avoid welding and other “hot activities” so close to delivery, the pool structure was built in fibreglass, and painted to make it blend in. Comfortable seating was added along with an Italian stone-clad bar and a gym was replaced by an intimate seating area and kitchenette – a favourite spot of the owner and his young family. “We tend to end the day up here, with afternoon tea,” he says. The mornings are spent around the second spa pool on board _11.11 _– forward of the superb panoramic owner’s suite on the upper deck. Despite being out the front and feeling a little exposed, it remains a private area and can’t be seen from the bridge above, making it an exclusive little enclave. Lucky guests, then, who get quartered in the VIP suite, with its vast acreage, private study, walk-in dressing room and six huge portrait windows. 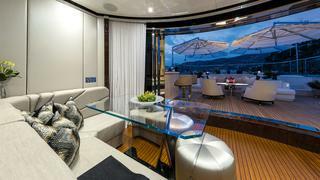 The rest of the guest accommodation is on the lower deck – two twins and two doubles feeding off a central lobby. 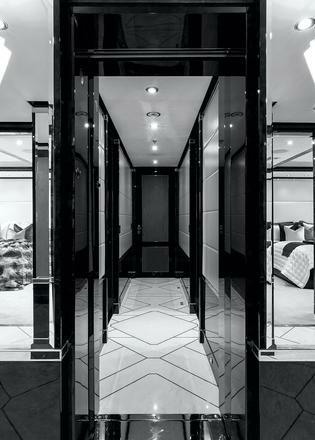 Each is dressed in the same art deco style, with Italian marble in the bathrooms – personally selected by the owner’s team at the quarry – and Lalique taps. 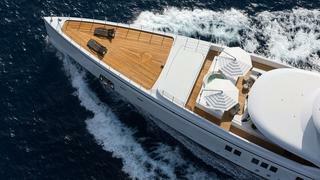 The exterior charges a few of those senses, too, and will inspire comment wherever 11.11 sails. 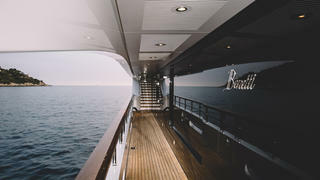 She’s not built on the same platform as Nataly but the similarities are clear, although whereas Nataly’s design was from the boards of Redman Whiteley Dixon, 11.11’s exterior is identifiably Benetti’s work. The decks bubble up behind that long nose, which ends in a near-vertical blade. A significant spray rail runs aft, to keep water off the decks – a common problem on boats with such an upright stem. The hull’s efficiency gains are still to be properly recorded but the captain, Vaughan Hill, is happy so far, reporting engine loading of just 65 per cent at her cruising speed of 15 knots. 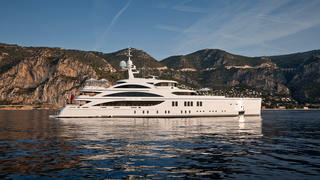 “We got her up to 17.5 knots on the run to Monaco from Livorno,” he says. “We had a head sea, with two metre swells. She stayed nice and buoyant and rode over the top, rather than falling into the holes.” Not that he has to worry about anyone getting seasick – the owner’s wife was a sufferer but she was treated by famous British hypnotist Paul McKenna and hasn’t had a dose since. 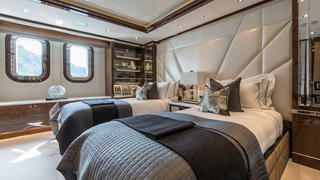 The benefit of 11.11's bow is more volume forward, and this has been well used in a big bosun’s locker and mooring area on the main deck, and generous crew quarters down below. 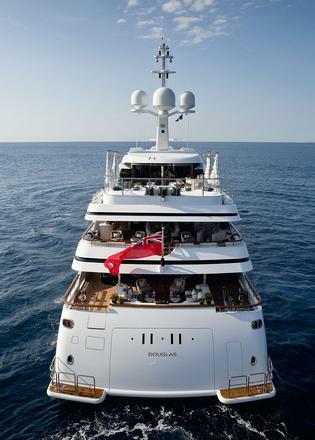 The yacht runs with 16 crew currently and the happiest of all is surely the chef, whose main deck playground puts the galleys of much bigger boats to shame. 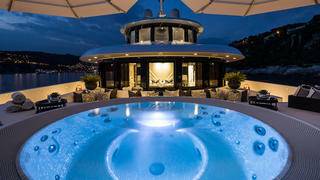 It’s also a superbly finished space, with – to the chef’s delight – big windows over the water and a central island. The owner didn’t spend a huge amount of time at the yard overseeing the finishing of this and other spaces, relying instead on his design team, but did make one very important visit towards the end of the build. “I flew from LA to London to Pisa for a single day, just to see 11.11, and went back to LA the next day. I wanted to see it before my family got on board – I’m a perfectionist,” he says. 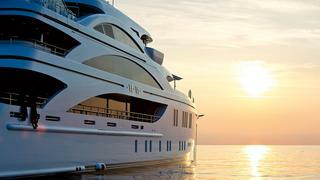 The owner’s winter cruising ambitions extend to the Caribbean – and might include the latest hot destination, Cuba. Plans could then include a tour of the Bahamas, Exumas (“so my daughter can swim with the pigs” - a Caribbean bucket list favourite), St Barths and Mustique before heading back across in 2016 for the start of the Med season. It’s a trip that wouldn’t have been possible this year had the owner not seized the opportunity of buying a part-built boat. 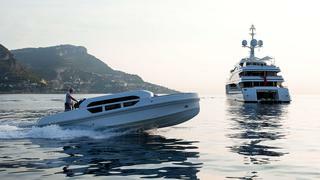 The timing was auspicious, like the name of the yacht itself. The 11th of the 11th is the owner’s daughter’s birthday, but 11 is also considered a “master number”, emanating all sorts of positive vibes. It’s definitely doing its job so far – doubly so. All photos courtesy of Jeff Brown/ Breed Media. Video courtesy of Breed Media.